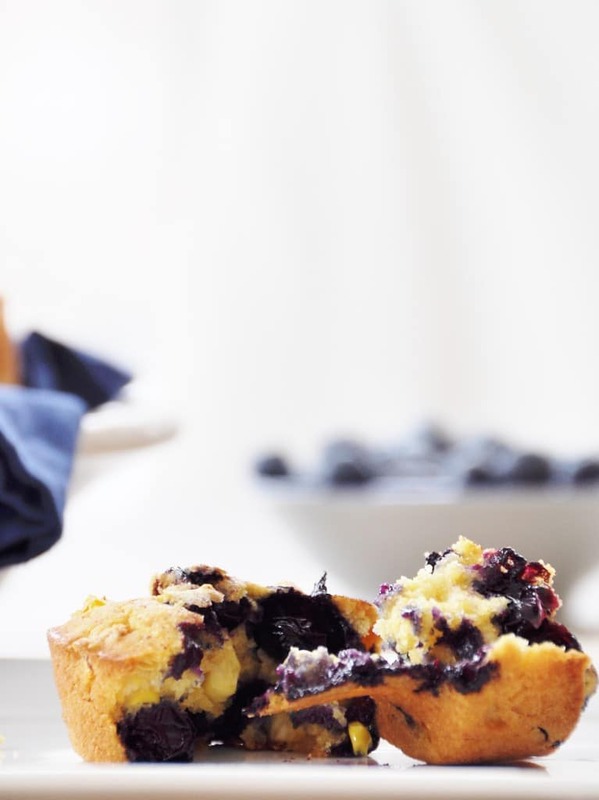 Crispy Blueberry Muffins with Fresh Corn! 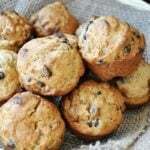 Remember the chocolate chip pecan corn muffins that I posted a few weeks ago? 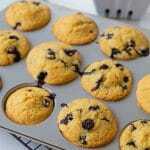 People really liked them, and a few were really surprised that corn meal was a component of the muffins. Guess what? The husband and I have taken corn meal muffins to another level, because we added fresh corn to the equation! Breakfast just got a whole lot better. You guys, these are freaking delicious. 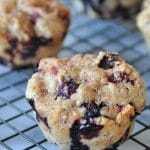 When I took my first bite of these delicious crispy vegan corn and blueberry muffins my eyebrows went up – way up. Then I melted into my chair and just enjoyed the moment, because I got to bite through the crisp, almost flaky “crust” of the muffin to reach the moist middle. 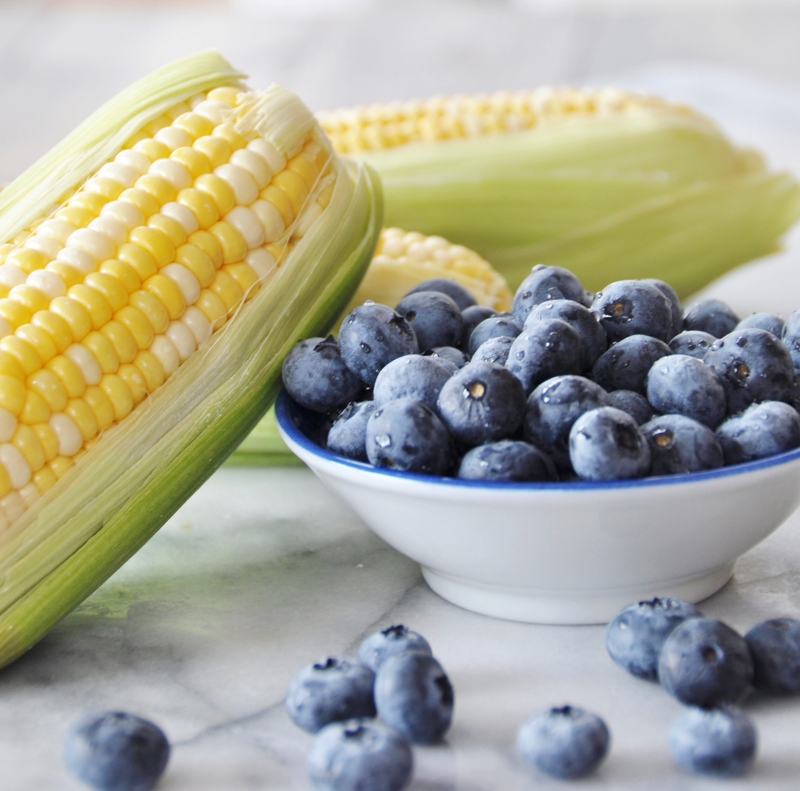 And in the middle of all of that wonderful texture were little explosions of tart blueberries and crunchy fresh sweet corn. 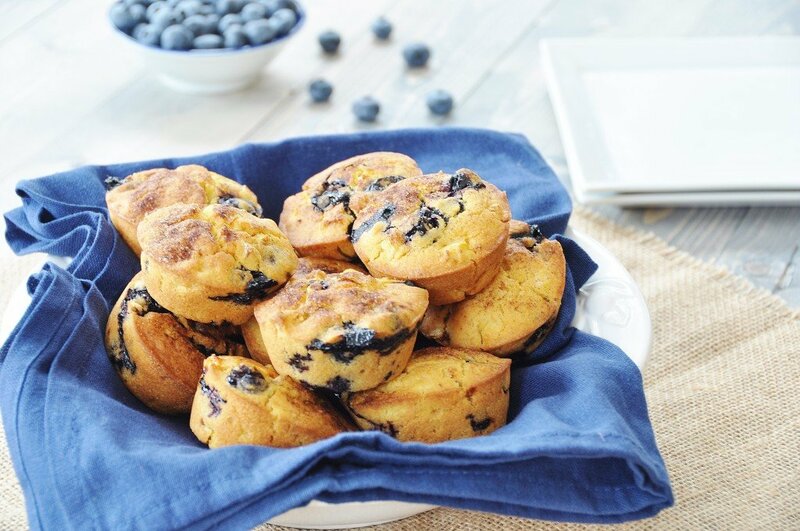 With my mouth full of a big, delicious bite of muffin (I hate it when people talk with food in their mouth so you know these where good), I told my husband that they were my new favorite. Move over lemon blueberry and chocolate chip pecan corn muffins, you run a very close second, but these are my new loves. 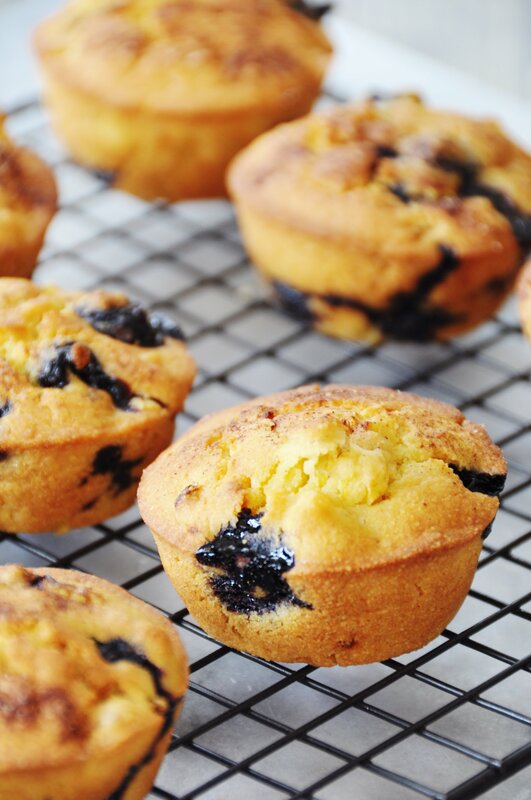 There isn’t a lot of sugar in these crispy vegan blueberry and corn muffins. Most of the sweetness comes from the fruit and the corn. And the corn and the cornmeal makes them kind of savory too. Then there’s the beauty queen factor. Can we just talk about how gorgeous these are? Golden on the outside and yellow and blue on the inside, the colors are so perfect together. These are really simple to make. The most difficult thing – if you can call this difficult – is cutting the corn kernels off of the cob and then using the back of your knife to scrape off the remaining corn “milk.” You could use frozen corn, but you can’t get that liquid from the kernel that boosts the flavor of the corn. Once you’ve scraped the corn all you need to do is whisk the dry ingredients together, fold in the wet ingredients, and then gently fold in the corn and the berries. 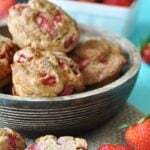 Spoon them into a muffin pan, sprinkle with cinnamon sugar, and bake until they’re perfectly golden brown. You’ll want to eat them while they’re warm to get the maximum crispness and blueberry flavor. 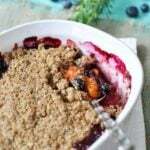 Is it just me, or do blueberries taste better when they’re warm? Crispy on the outside and moist on the inside. 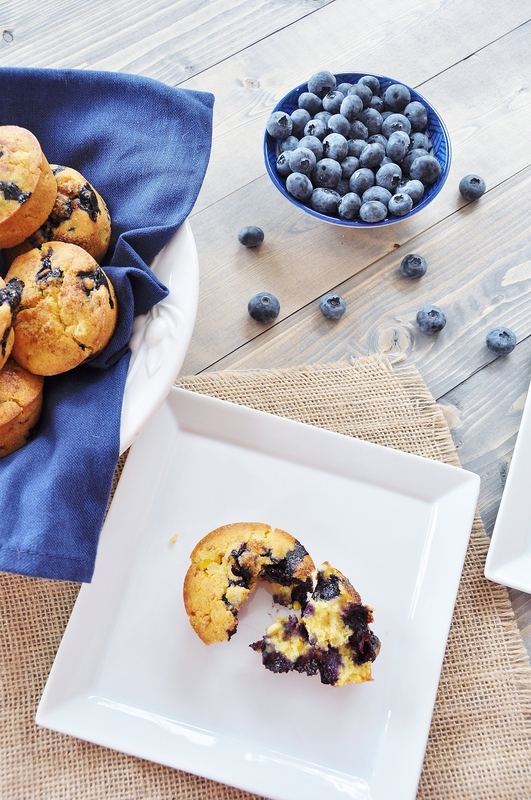 The sweet corn kernels and tart blueberries burst in your mouth making these the most deliciously sweet and savory muffins ever! 1 cob of fresh corn (or 1 cup of frozen corn) – Cut the kernels from the cob and scrape the corn “milk” from the cob. Combine the dry ingredients in a large mixing bowl and whisk well. In a small bowl whisk the egg replacer, vanilla, and orange juice, and canola oil until combined. Add the almond milk and whisk well. Combine the cinnamon and sugar in a small bowl. Pour the wet ingredients into the dry and gently fold with a spatula until just moistened. Scrape the wet ingredients to ensure that you get all of the egg replacer out of the bowl. 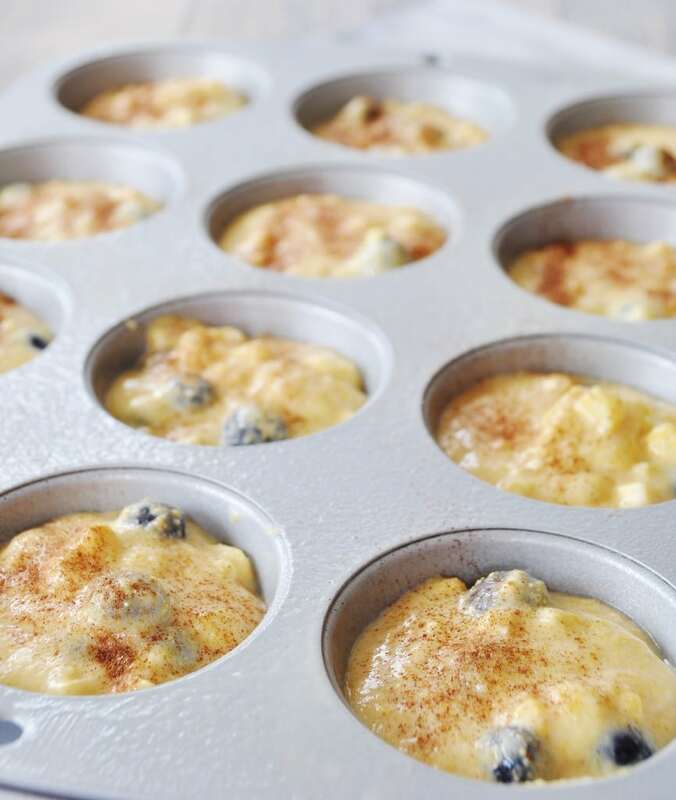 Gently fold the corn and blueberries in the batter until just combined. Don’t overmix. 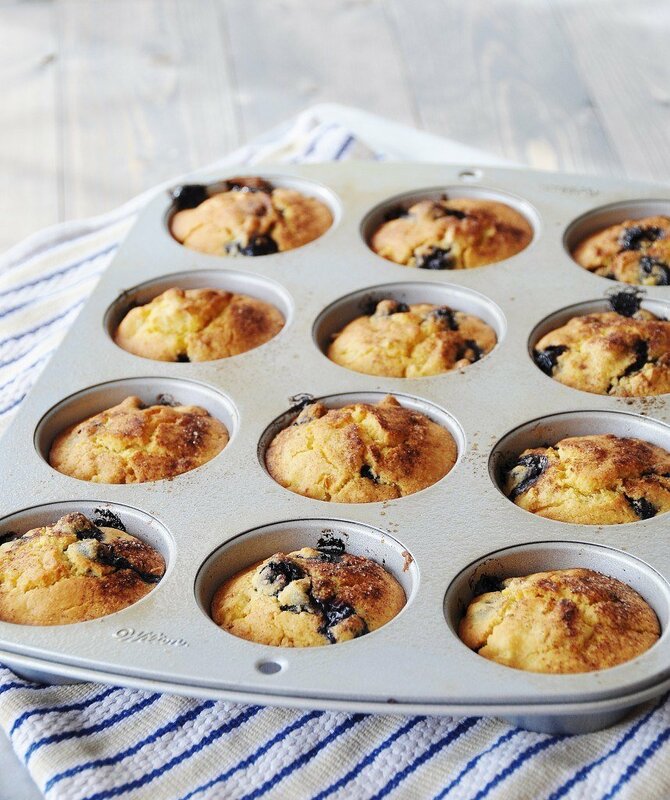 Use and ice cream scoop or a small ladle to fill the muffin tins. Fill 3/4 of the way to the top of each well. 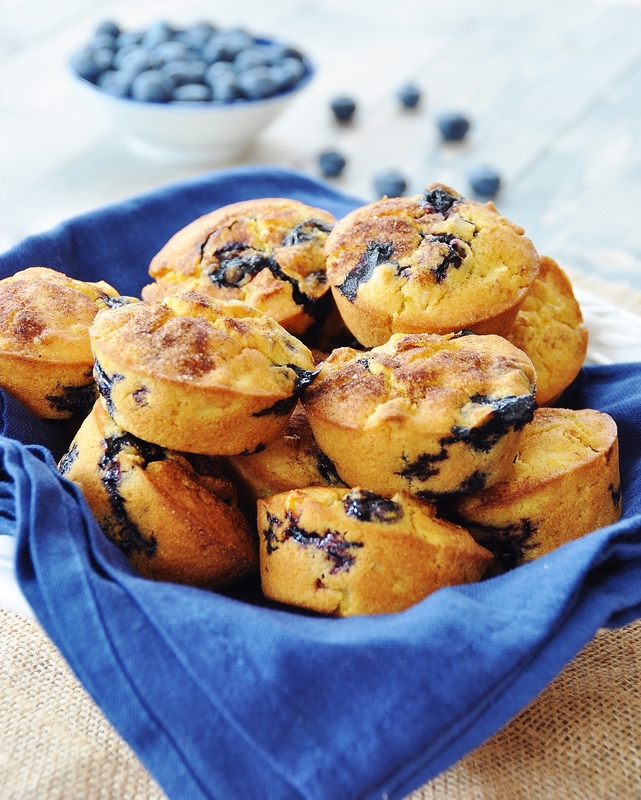 Sprinkle the cinnamon sugar over each muffin and bake for 25 minutes or until golden brown and a toothpick comes out clean from the center of the muffins. Cool on a wire rack for 5 minutes and then remove the muffins from the pan and let cool upside down. These are best when eaten slightly warm. Store in an airtight container for up to 3 days. Heat for a few minutes in a hot oven to crisp up. Is the canola oil considered a wet ingredient? If so, it doesn't say when to add it. Hi Kristin. Yes, the canola oil is a wet ingredient and I see that I missed it in the instructions list. Thank you for asking, I've updated the recipe. Please let me know what you think of them. Have a wonderful weekend. 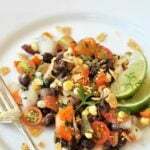 Can you make these without using the frozen or fresh corn...just the cornmeal??? would you need more liquid if so?? thanks! these look great! Hi Patty! Yes, just add a 1/2 cup more blueberries. Enjoy! Just made these, and I love them! The fresh corn adds crunch, and they are just sweet enough. I made mini muffins, so I baked them for about 12 minutes and then two more on broil to get them nice and golden on top. Will make these over and over and over! Thank you! Hey Pauline! Thank you so much for letting us know how it went! We're so happy that the recipe turned out so well : ) Hope you decide to make more of our recipes in the future and keep letting us know how they turn out! Have a wonderful day!